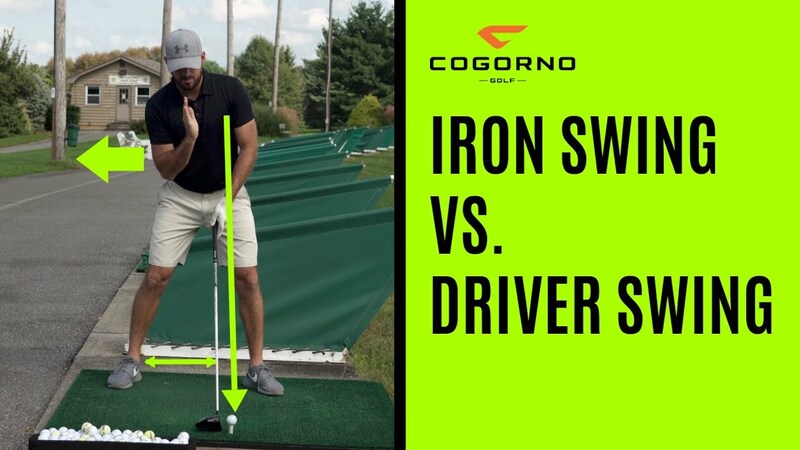 Let’s start with what’s different between the iron and the driver swing in terms of the setup. , The first part that will change is going to be ball position. For an iron, I like to see the ball somewhere between my sternum location or shirt buttons and shirt logo. Second, I want my feet shoulder-width apart. If I drew a straight line up from my ankle bone, I’d want it to be at or slightly outside of shoulder width. With an iron, I’m also going to have a minor amount of access tilt, or a lateral bend (almost like a right oblique crunch). Ball position with the driver is more forward. Where the ball is in space is going to be more in line, sort of with my left heel or middle of my left foot. In terms of upper body, I like the driver to be somewhere between shirt logo and armpit and shoulder location. The driver is the only club I’m trying to hit as far as possible, not just a certain distance. I want max speed with this club, so my feet need to be wider than with an iron. I also have more side bend with the driver so I can hit up on the ball. Important to note, side bend or access tilt is not my left hip bumping forward. You want the left hip to stay where it is. I create the tilt through a little bit of a right side crunch. In swing, changing the angle of attack is the main difference between the two clubs. The goal of what I’m trying to do with an iron and driver is drastically different. With an iron, the ball is on the ground. Also, the way iron is designed – with the loft on them – I need to use this tool in a certain way to make it work. With an iron, I need to hit downward on the golf ball. With a driver, the ball is not on the ground anymore. It’s the only time where the ball is teed up. So, because the ball is up in the air and – again – because the club is designed differently than an iron (with significantly less loft) I need to swing a little bit different. I want to hit pretty level with the ball or even slightly up to maximize distance. The more I hit up on the ball, all else equal, the farther the ball goes. If you swing 100 miles an hour and hit five down – so hit down too much versus hit five up on the ball – could be literally like 25, 30 yards difference. It’s important to know that the more down I hit on the ball, the more it pushes my swing path to the right. The more I swing up, the more it pushes my path to the left. This means if you are hitting more up with your driver, your path with your driver will be farther left. So, if you’re going to hit up on your driver, you also probably need to shift your swing direction more to the right to offset it. You’re not going to make a drastically different swing with your irons and your driver. Meaning if you have a swing flaw, let’s say you’re working on your takeaway or maybe you’re down swing is too far over the top, your down swing is going to be too far over the top with all the clubs. Your swing kind of is what it is. Meaning whatever piece you’re working on, you should be working on for all clubs.